If you haven’t checked out my husband’s new book project yet, Goodbye Paris, I feel bad for you. People nominate “adventures” for him to do, we do them and then he writes about them. Mostly it’s fun. Except for when we have to get to Père Lachaise Cemetery only speaking French with no directions. Then I hate it. Fortunately our friend Caroline was visiting and she offered to babysit. She’s the best (also single). 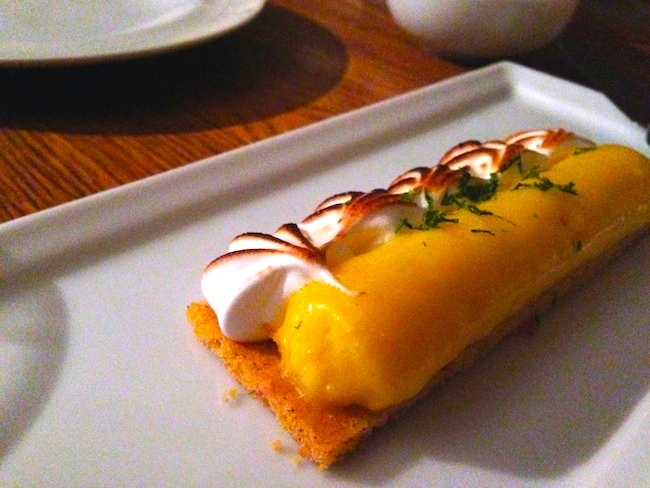 Joe and I gussied ourselves up and strolled over to Daniel Rose’s restaurant, Spring. They serve a prix-fixed menu so you have to be come prepared to be adventurous. You should also come prepared to get fat, but again as is with everything else in Paris, so worth it. Here are some pictures of our meal. The lighting wasn’t great in the restaurant (it’s in a cave and all), but I still wanted you to see it. The amuse-bouche are small, delicious tastes before the formal courses begin. At Spring, we received four little bites of deliciousness: razor clams, venison with jam and sliced pears (venison and ground pears not pictured). The jam complimented the gaminess of the venison perfectly and the pears added a nice crunch. 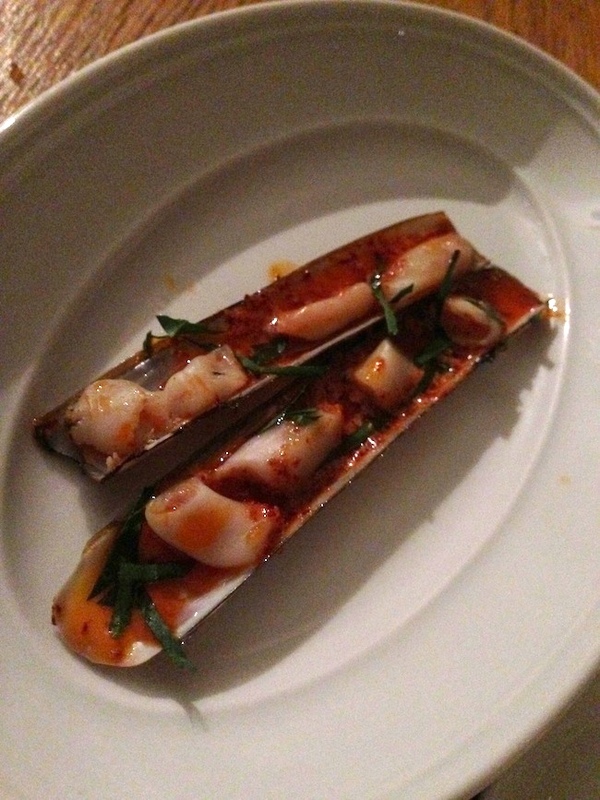 Chef Rose’s razor clams had a nice, spicy kick to them, which was a perfect touch of color to the series. It was a great first impression. 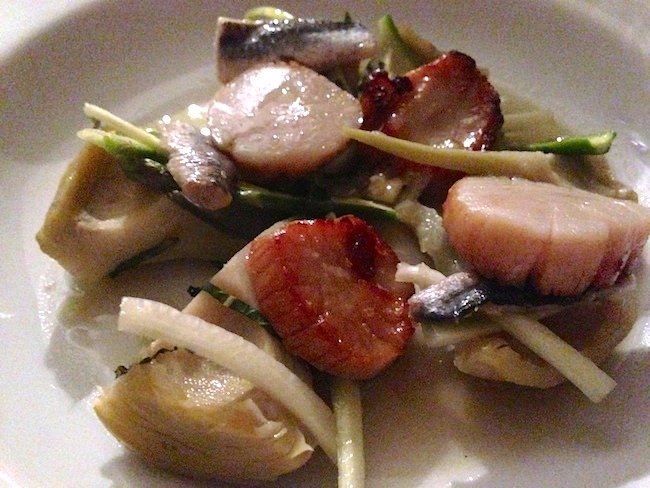 Seared Scallops with asparagus carpaccio, artichoke heart, fish and mint. This was delicious and it looked beautiful on the plate as well. The scallops were cooked perfectly, they melted in your mouth with a nice crunch from the asparagus. 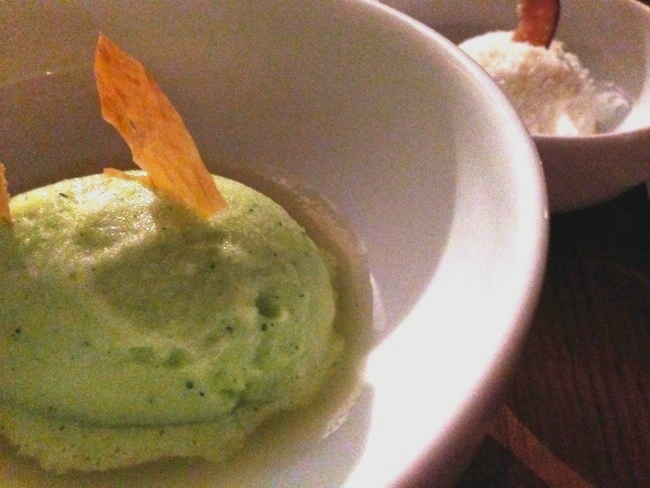 The artichoke brought a nice level of acidity to the dish and the mint brought everything together, in a unique flavor profile. 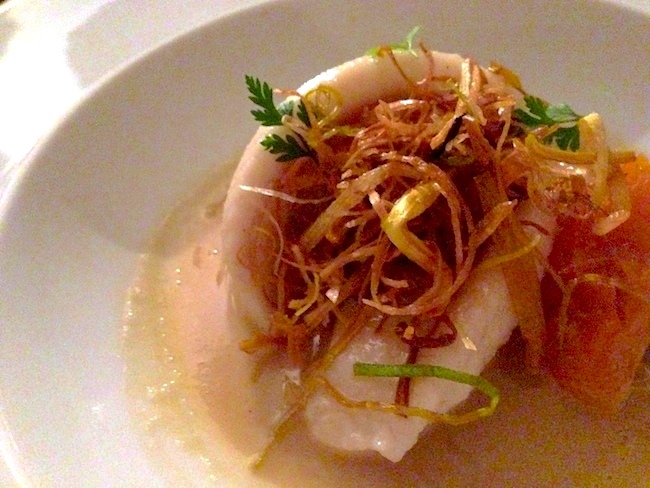 Sole with button mushroom, kumquat, fried leeks in a foie gras and chicken broth. I expected to be underwhelmed by this dish, but was pleasantly surprised. The dish had all the components I was looking for, crunch (leeks), sweetness (kumquats) depth of flavor (foie gras) and melty-in-your-mouthness (no really, it’s a thing) from the sole. The kumquats were particulary tasty, cutting through the heaviness of the foie gras and brightening your mouth. 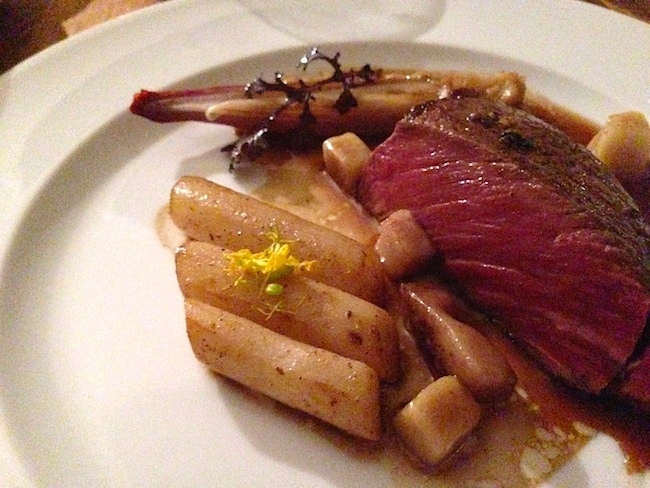 Filet of boeuf with tubular parsnips, caramelized shallots and a bone marrow jus. If I could eat bone marrow every day for the rest of my life, I’d be okay. Bone marrow is buttery and flavorful, I loved it in this sauce. And of course it goes perfectly with filet. And oh was the filet tender. I cut it with a butter knife and it melted when it hit my tongue. I vote yes on this dish every time. The finale ended up being the most playful. We had pineapple and cilantro sorbet, a coconut cream puff, Italian citrus brûlée tart, and sautéed bananas in a spiced rum sauce. I am really not into fruit for my dessert. Fruit should be eaten to be healthy. Dessert is chocolate, dark chocolate, and never fruit. So when this course first arrived I was sad there was no chocolate. However, as I ate I realized how well it complimented the meal, and omigosh was it GOOD. 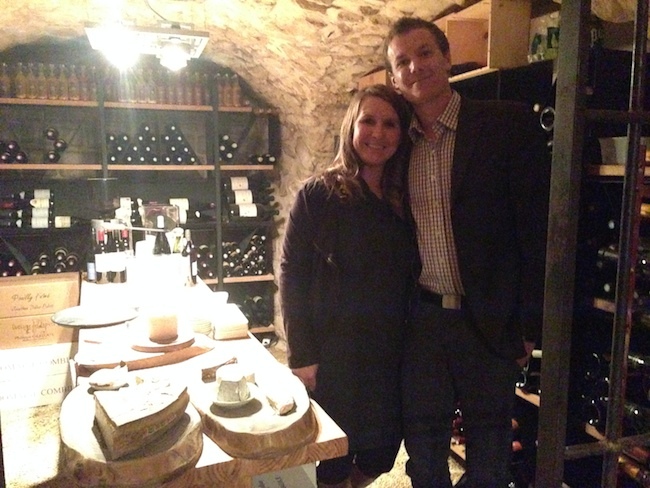 After the meal we asked our waiter to take a picture of us and so she invited us downstairs to the wine cellar where the lighting was better. My in-laws arrive in three weeks and we want to try out one other foodie type restaurant. Where should we go? What’s the best meal you’ve had in Paris? Wow! I am jealous! Looks fantastic. Hope you took good notes so you can cook it when you come home. those things sticking out of the dessert make it look like a gold fish….. ewwww…. but i’m mostly telling myself that b/c i’m home eating less than glorious food….